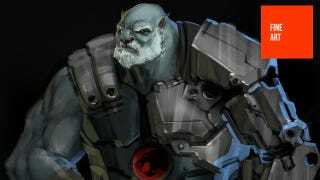 Thundercats, and Concept Art, Ho! Tyler Breon is an artist who has previously worked on properties such as Spider Man, Uncharted and God of War, including the most recent title in the series, the upcoming Ascension. He's currently employed at Big Red Button Entertainment, who are working on unannounced projects. If you like what you see here, you can check out more work at Tyler's personal site.